Today Staffan gave an important talk about how contaminations contaminate common databases. -Jane will be on holiday next week. -If you want to Sanger sequence send your samples before the 17th of April. -A reminder that Jacob will play in Grand Hotel on Saturday at 21h. -The 27th is Biology Day with scientists presenting their work in the Biology Building. Today Ben Halliwell gave an interesting update about sociality, reproductive mode and the divergence of life history strategies in squamate reptiles. Today Bengt gave a very interesting talk about epistasis. Kristaps published his master thesis and brought cake to celebrate. Today Jacob Roved gave an interesting talk about his latest results on MHC haplotypes in great reed warblers and how to unravel patterns of selection. Dennis received the import licenses for bird blood samples. Today Vincenzo gave a very interesting introduction to disease ecology to prepare for a teaching assignment. Let Mikkel know as soon as possible when you want to invite someone for the autumn Department Seminars. Today Kristaps Sokolovskis gave an interesting talk about changing passerine community in Arctic, accompanied by delicious semlor. We welcome research visitor Zohre Eslami from Shiraz University (Iran) to the lab. She will be working with Bengt Hansson on landscape genomics along a thermal gradient in Iran using damselfly Ischnura elegans. Jane reminded us to make sure you know the lab machines before using them, to take care of material (e.g. tip towers) and clean after working. Jacob’s band will be playing in Lund on the 13th of April. Today Vienna Delnat from the University of Leuven, Belgium gave an interesting talk about daily temperature variation shaping how a pesticide increases mortality and decreases heat tolerance. Today Weizhao Yang gave an interesting talk about the genetic basis for the sexually selected introgression in wall lizards. Kristaps Sokolovskis gave a talk about Harenna forest and its endemic puff adder: An adventure in Ethiopia. We started of by, despite cold weather, taking annual group photo outside of department! Jakob and Elsie both brought delicious cakes (carrot and coconut respectively) for us all to enjoy with hot coffee after posing for photo out in the cold. We found out that Molecular Ecology students are done with their course work and all their PCRs worked, good Job Samantha and Julian who assisted them in the lab! Jakob’s thesis nailing will take place next Thursday (7th Feb) at 15:00. Lars gave a truly interesting and discussion stimulating talk about balancing selection on PRR genes in bank voles. We all also learned about “beta statistics” as a novel way to search for signatures of balancing selection. 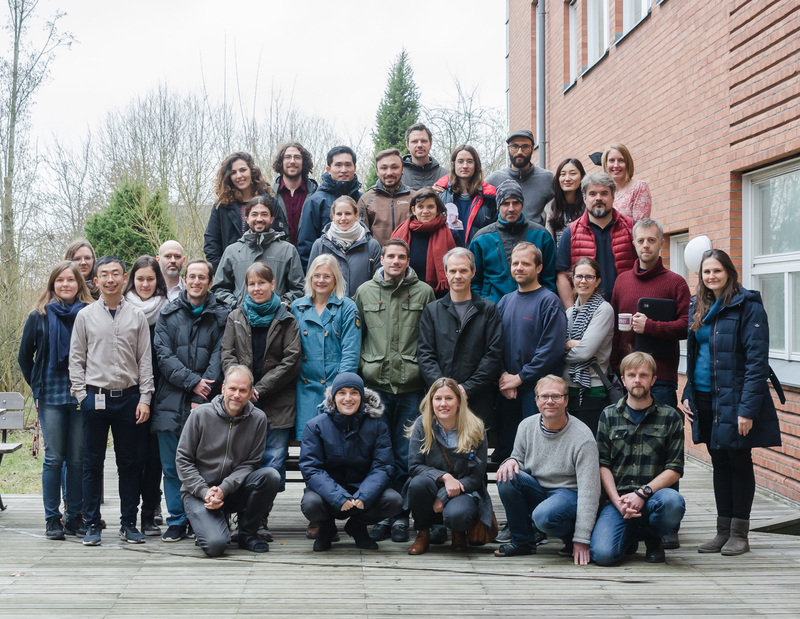 Meel group photo taken by Inger Ekström on 31.01.2019. If lab members don’t mind this shall be used as lab photo for 2018 as we forgot to take one last year. Next years photo will be taken in Nov/Dec as usual. Go to the MEEL homepage to read about our research, courses, projects and people!